I met up with a lot of folks that I knew at this show and none of us had much of a clue what to expect. The band was three guys, the drummer from the Ruins, the guitarist from Acid Mothers Temple and a bass player, who I think has played with both before. Anyway, they started at about 11 and appeared in several different configurations. First they started with the bass player playing guitar and the guitarist on violin and the drummer. They did a set that was all just them singing strange stuff for 15 minutes. Some of it was very funny and cool. The drummer did an incredible set by himself with a drum machine and samples. He was totally awesome. The bass player was also really excellent and they had some killer grooves together. 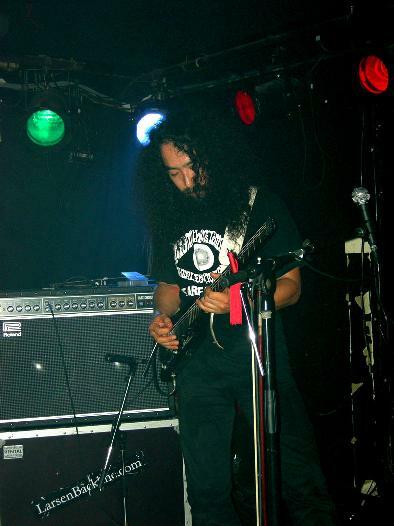 Acid Mothers Temple ended the show with about 40 minutes of some killer intense psychedelic rock. The club was crowded and people seem to be into this really strange stuff. It was really great fun to see and hear but I am not sure you would want to listen to this concert at home. A fun night.